The side of an office building in Sokol, Moscow has been converted into a huge billboard for the Samsung Galaxy S7 edge. It stands 262.47 feet high by 131.23 feet wide. The sign can be spotted 1.37 miles away at Moscow's Moscow’s Gidroproekt building, and is viewed each day by 800,000 people. The sign is actually made up of LED panels, and is placed at a location that connects downtown Moscow and Sheremetyevo International Airport. Besides automobile traffic, a photo of the sign taken during the evening seems to show plenty of foot travel on the road that leads straight to the building. And the traffic on the highway that winds around the sign also appears to be heavy, based on the photographic evidence. The Samsung Galaxy S7 and Samsung Galaxy S7 edge are selling well, with the Galaxy S7 on track to set a company record for most units sold during a new smartphone's first year. 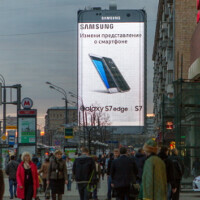 A gigantic billboard like this one can't hurt as it constantly reminds Muscovites and visitors to the city that Samsung has a curved screen Android handset that looms large in the industry. How much did Samsung pay to get that type of Ad on that building? Free Galaxy S7 for each of the apartment owner there. It is not made by Samsung for S7 exclusively. This LED board was here for years. It has S5 and S6 ads too as a well as some Yandex ads. Do you know folks that now Best Buy is offering a free 32-inch Samsung Smart HDTV http://goo.gl/ATokV3 with purchase and activation of one of galaxy s7 or edge ?